Republican Rep. Pat Tiberi (Ohio) announced Thursday that he will not seek reelection in 2018 and leave his seat in Congress early next year to take over the Ohio Business Roundtable. "Today, it is with a humble and thankful heart that I announce I will not be seeking reelection," Tiberi said in a statement. "While I have not yet determined a final resignation date, I will be leaving Congress by Jan. 31, 2018." "I have been presented with an opportunity to lead the Ohio Business Roundtable that will allow me to continue to work on public policy issues impacting Ohioans while also spending more time with my family," added Tiberi, a senior lawmaker with close ties to his party's leaders. 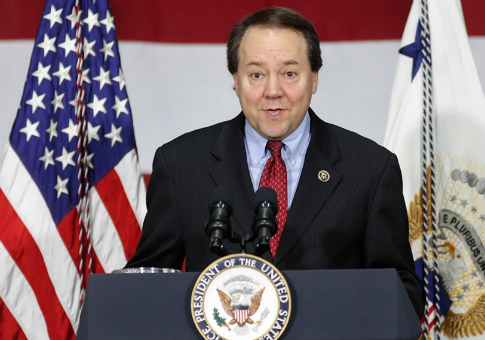 Tiberi, a member of the tax-writing House Ways and Means Committee, expressed appreciation for the people of Ohio's 12th district. He has represented the Columbus-area district since 2001, when he first entered Congress succeeding current Ohio Gov. John Kasich (R.). The New York Times first reported Wednesday night that Tiberi, 54, was expected to resign, noting that the move may be a sign of mounting frustration among Republicans in Washington, D.C. According to Tiberi's October quarterly report to the Federal Election Commission, he still has $6.6 million in his campaign account, Roll Call reported. This entry was posted in Politics and tagged Congress, House of Representatives, Ohio, Resignation. Bookmark the permalink.